Trinity Sound Company (TSC) recently completed an upgrade to the in-house music playback and paging system at Brea Community Center that included a QSC Audio Q-Sys Core 250i processor and two additional CX Series multichannel amplifiers. The community center, located adjacent to the Brea Civic and Cultural Center in the heart of the city, which is located about 25 miles southeast of downtown Los Angeles, offers facilities for business and community meetings, youth and adult education, and health and fitness activities. This was one of the very first installations of the lower cost Q-Sys Core 250i, notes Devin DeVore, president and owner of TSC, an Ontario, CA-based company that offers live and installed sound production services as well as studio and remote recording. The Brea Community Center houses everything from a basketball gym and aerobics classes to meeting rooms, according to DeVore, who also installed projectors and other AV equipment during the upgrade to the center. 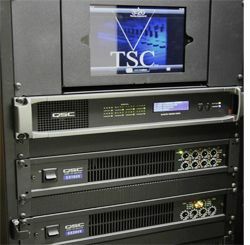 TSC retained the previously installed QSC Audio CX Series multichannel amplifiers and added two more CX Series amps—a four-channel and an eight-channel. “Using the DataPort cables, we were able to link into the network, so we have load monitoring and system performance data that shows up on the app, too, so that the facility staff can make sure that everything is working and that there are no blown speakers,” DeVore said. Additional system control is available in the main entrance lobby. “From the front desk they can page into different areas,” he explained. “Using the Q-Sys Control app we also created a few pages for them to control the room combine, and control their music playback. We set the system up to play back music using the audio file player that’s in Q-Sys. That runs on a calendar, so every day at 7 a.m. it fires up a playlist and plays music through the concourse.